One of the most popular requests that our designers receive at the Granite Countertop Warehouse is for information on granite showers. Many of our customers from all over Metro Atlanta want to know more on installing granite in their shower. From Buckhead to Roswell to Peachtree City…granite showers are growing in popularity. It’s not only granite; people are requesting other natural stone like travertine and marble. Some people prefer the whole slab look because its luxurious appeal, like Arctic White granite, but others prefer the durability and moisture resistance. Natural stone is very strong and very easy to clean. Maintenance is a breeze. Our sealers add additional moisture resistance. To protect your investment, every piece of stone we fabricate is equipped with a 10-year stain protecting sealer. Application of the sealer is completed in our fabrication shop prior to installation, so all you have to do is enjoy it! The sealer is absorbed by the stone and designed to fill its pores. This causes future spills to pool on top instead of being absorbed by the stone. This is your first defense in stain protection, and you will not have to do a thing for 10 years! Also, we now offer a lifetime sealer! Granite and natural stone fabrication is not easy, you need an expert to design, fabricate and install. Granite in Atlanta is not hard to find, but a professional, reputable and affordable company is. 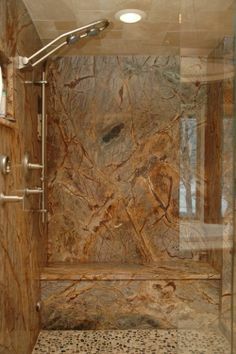 Granite Countertop Warehouse has the technology, experience and expertise needed for granite and natural stone showers. To speak with a designer about granite showers call 678.809.5188 or make an appointment. If you prefer to come to our showroom in Acworth, no appointment is necessary.